Carlsbad Chamber of Commerce Green Business Committee members learned how Pacific Ridge is leading the way in sustainability in schools. Mrs. Symington, Director of Sustainability, spoke about the school’s use of natural light to reduce electricity consumption and the use of refillable dry erase markers and varied recycle receptacles to reduce landfill waste. 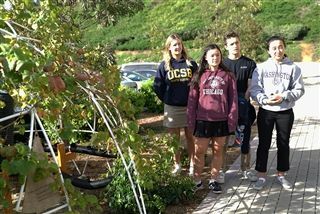 Gardening Club seniors, Kira Mok, Jordi Bertrand, Grace Sandel and Sydney Schmitter toured the Committee members around campus to highlight their club’s commitment to sustainability.